AUSTIN, Texas, Sept. 19, 2018 /PRNewswire/ -- Silicon Labs (NASDAQ: SLAB) offers a new Wireless Xpress solution to help developers get IoT applications connected and running in a day, with no software development necessary. Silicon Labs' Wireless Xpress provides a configuration-based development experience with everything developers need including certified Bluetooth® 5 Low Energy (LE) and Wi-Fi® modules, integrated protocol stacks and easy-to-use tools. "By using Bluetooth and Wi-Fi Wireless Xpress, developers can move from product concept to prototyping in a matter of hours instead of weeks," said Matt Johnson, Senior Vice President and General Manager of IoT products at Silicon Labs. "Wireless Xpress greatly reduces the design learning curve without compromising sophisticated Bluetooth or Wi-Fi functionality. Developers will spend less time learning how to add wireless connectivity to their IoT devices and more time designing innovative, distinctive products and getting them to market ahead of the competition." With on-board wireless stacks controlled through a high-level Xpress Command API for setup and control, Wireless Xpress devices require only modest resources from a host processor, enabling developers to add wireless connectivity to any microcontroller (MCU). Bluetooth and Wi-Fi IoT products based on Wireless Xpress can be remotely managed and updated over the air (OTA) using native device management features. With Silicon Labs' Zentri device management service (DMS), end users can easily install and update firmware, view real-time device health metrics and adjust product settings through mobile apps. To ease the complexity of adding Bluetooth or Wi-Fi connectivity to mobile applications, Wireless Xpress includes a mobile app SDK for Android and iOS. The mobile app framework comprises examples and libraries and offers simple communications and OTA APIs to accelerate app development and simplify wireless design for mobile platforms. Wireless Xpress takes advantage of Silicon Labs' Gecko OS, an intuitive, simple-to-use IoT operating system that accelerates the development of market-ready connected products. Silicon Labs plans to offer additional Gecko OS-based products and solutions in the future. Silicon Labs' Bluetooth LE BGX13P and BGX13S modules are available today in a choice of pre-certified PCB and SiP modules, respectively, with integrated antenna options. The Wi-Fi AMW007 and AMW037 PCB modules are also available today. Module pricing begins at $4.09 USD in 10,000-unit quantities. Wireless Xpress evaluation kits are available now and priced at $40 (MSRP USD). Developers can download the Wireless Xpress SDK with code examples through Simplicity Studio. 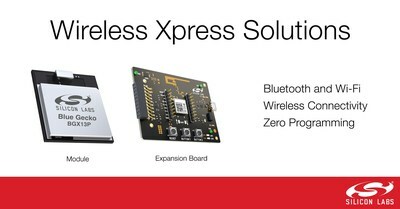 Wireless Xpress mobile apps for Android and iOS are available at https://github.com/siliconlabs/wireless-xpress. To learn more about Wireless Xpress solutions, visit www.silabs.com/wireless-xpress.